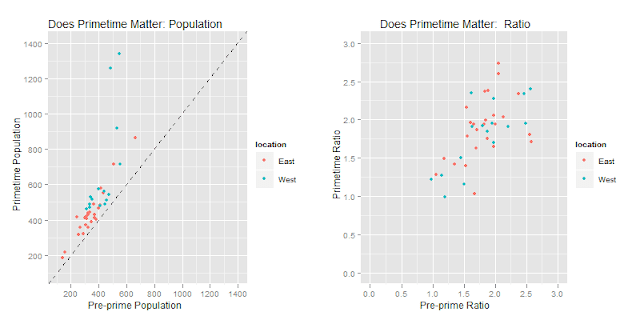 One thing I'm interested in is understanding how accurate any population rankings I observe can be (from the previous post). Differences between nights aren't as large as you might expect. I'm pretty sure that if I ditched the weekday labels, it'd be hard to match the charts to days of the week. (Other than the Tuesday downtime.) Saturday looks an awful lot like Monday. And even though Sunday is the heaviest play time... it isn't by much. Time of night matters much, much more. Just for example, the difference between 7 and 9 pm PST is huge on a West Coast server (22 vs 24 on the charts). What does that mean? 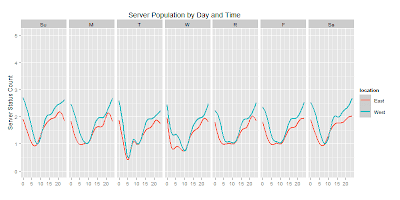 I sampled the data for the last post over three hours on Saturday night, so I'm understandably nervous that the time it took to observe the server populations could have an effect. Thankfully, none of the servers I examined changed their status around sampling time. 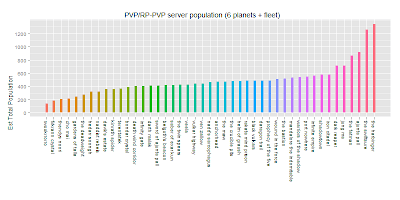 Even better - only Infinite Empire (top left, green) shows a mismatch between the server status and the observed population, with more people than would be expected. 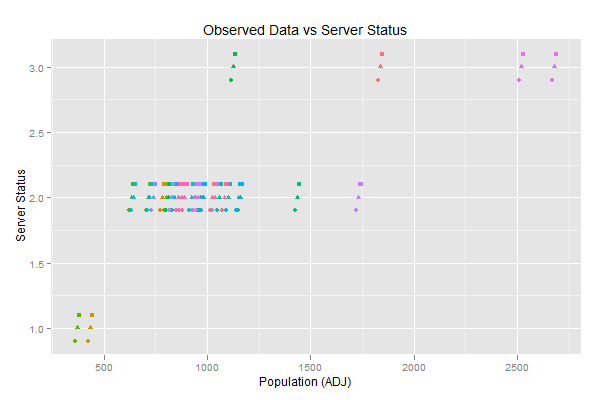 While the observed data broadly match the server status - the same can't be said of the rankings between servers over time. 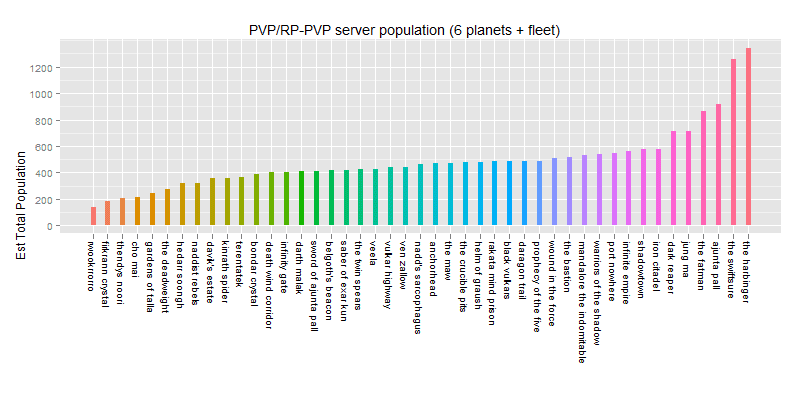 To show this, as I collected the data, I sampled two servers (Prophecy of the Five and Veela) at multiple times as I collected the data. 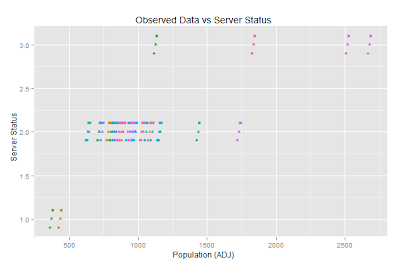 Because I'm drawing the data from different times, the observed total population of each server moves pretty dramatically across the scale. Unfortunately, this makes answering whether Po5 has a higher/lower pop than Mandalore something I can't tell with any confidence. 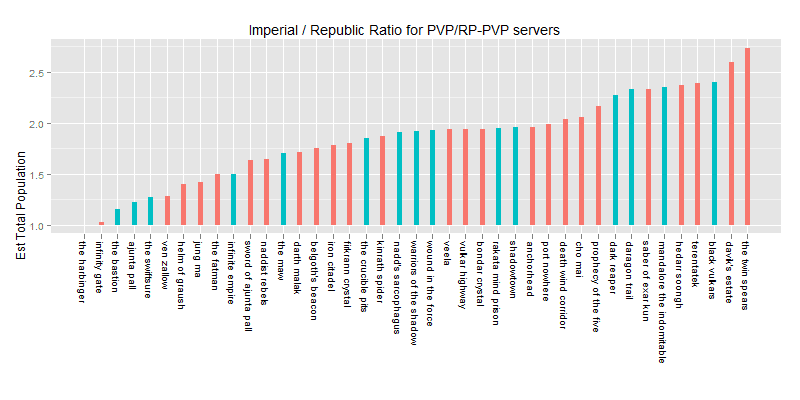 But instead of being concerned about server size... what about the balance between factions? How much does that move over the night? 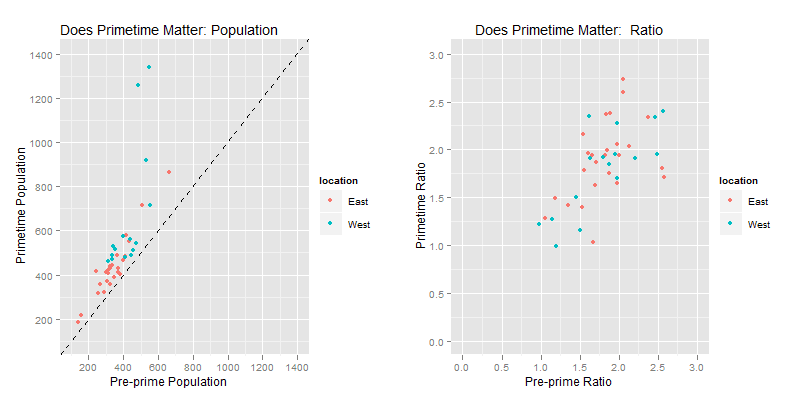 It shouldn't be any surprise that the server populations are smaller pre-primetime. Curiously, that doesn't seem to have any effect on the balance between factions, which doesn't show much movement between times. 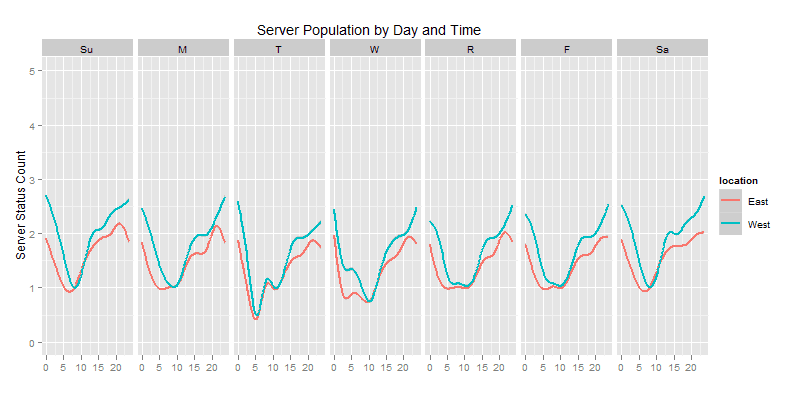 TLDR: Server populations are consistent across days, but change pretty dramatically over the course of the night. These swings make estimating the relative size of servers pretty difficult. 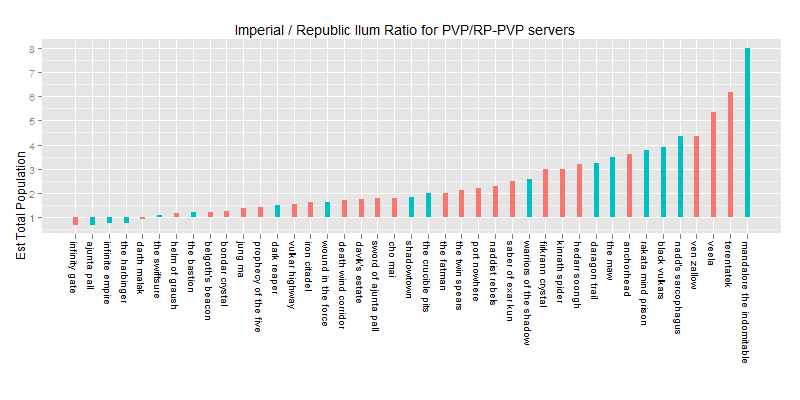 Fortunately, these changes don't influence the estimated balance between factions. 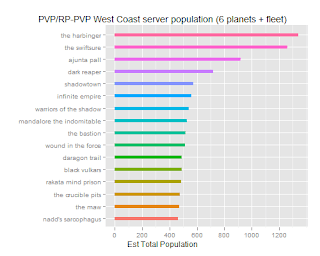 *note: as with the previous post, The Harbinger isn't a PvP server, its just there for a point of reference. Hazards of reading cool stuff on the internet. Sometimes, I get inspired to do things. Absurd, fun, crazy things. 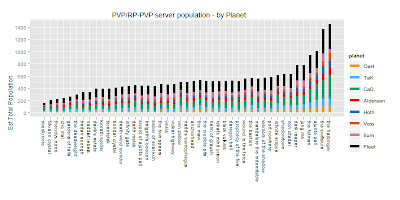 Case in point: I read a post by Dulfy on PvE server population and balance. 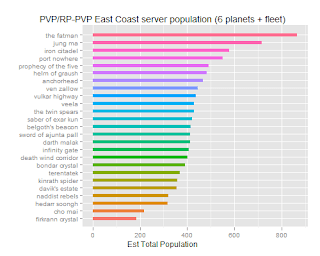 She created two level 1 characters on each server and used the /who list to record the population numbers on six planets plus the fleet during prime time on each server (6:30-10:30 EST for East Coast servers and 6:30-10:30 PST for West Coast servers). 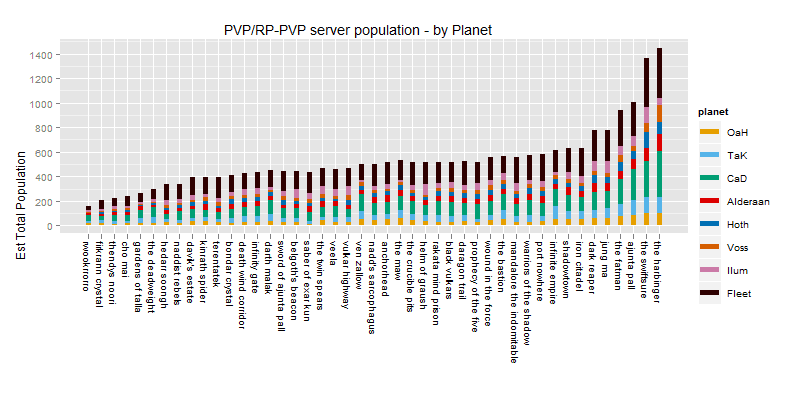 I just had to know what the data looked like for PvP servers. 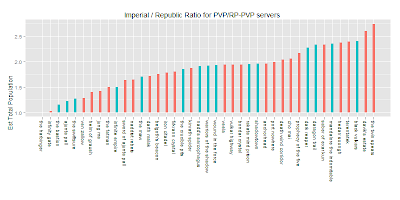 These charts replicate the server pop / balance data presented by Dulfy. 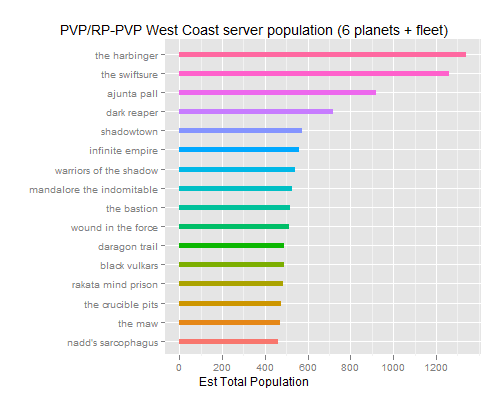 NOTE: to aid comparisons, I've added The Harbinger, a pve server. 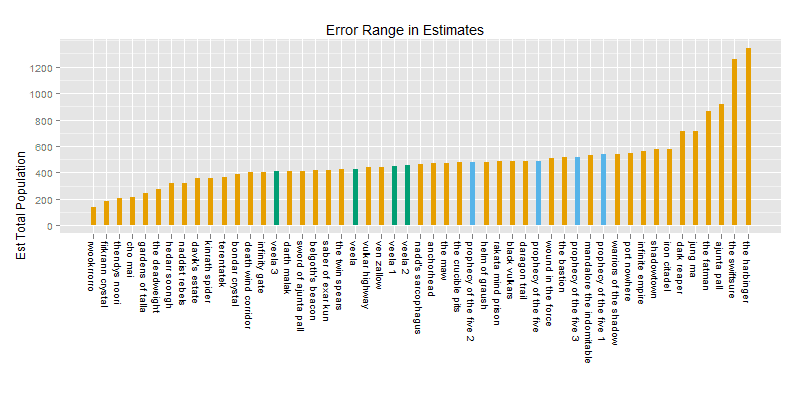 In a follow-up post, I'll extend some of this analysis and comment on how reliable I think these numbers are. If you do any hopping around outside of the class quest line, its pretty easy to forget what level each planet covers / when to do any bonus series / when you can hop into a flashpoint. 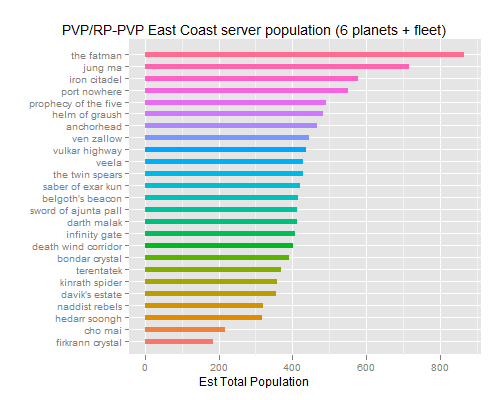 Fortunately, from the forums, and a couple infographics, here are SWTOR's planets, instances, and bonus series by level. 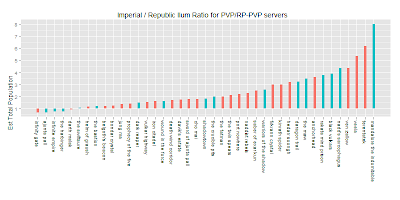 OldRepublic.net has an excellent flowchart of planets and instances by level. Force Junkies has a nice map. This blog is some mix of stuff I'm tired of looking up on the internet and a rambling compilation of things in MMOs that I get geeked about and interested in exploring. If you find it interesting, most excellent! Should you not like that link... for shame! For shame!